Suzuki will be debuting a new concept C-segment crossover called the S-Cross at the 2012 Paris Auto Show. They've released a teaser ahead of the show to stir speculation. 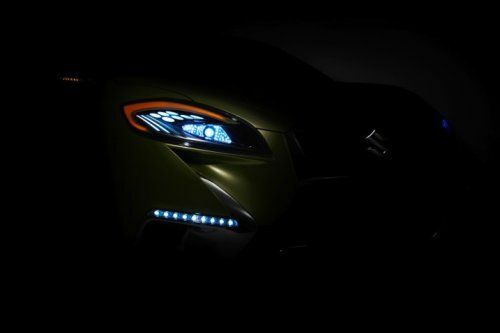 Suzuki has already announced that they'll be unveiling a new compact crossover at the upcoming Paris Auto Show this year. The car is known as the S-Cross and will be shown in conceptual form, but is expected to be a near-production concept rather than just another "show car." The S-Cross is believed to be replacing the outgoing SX4, which has seen flagging sales as an outdated SUV design. A sketch of the car was revealed in rough form today, but the more muscular, intriguing, and mysterious left-front headlight and fender photo is the real star here. Suzuki has been upscaling their designs lately and pushing for a more aggressive, muscular look rivaling those of its competitors Nissan and Subaru. The carmaker has been dominating emerging markets like India, but has failed to keep anything more than a toehold in established markets such as North America. The S-Cross will likely be the Japanese automaker's push upwards to try to get a firmer position here and if this teaser says anything, it says "aggressive cutting-edge" all over it. If there is any market where Suzuki might have a good chance of getting somewhere in the U.S., it's the compact crossover segment. The rendering of the headlight itself shows a bulging, muscular front fender and another in silhouette behind. The peering headlight is speckled with LEDs with a deep cut directly underneath it to suggest airflow around the brakes. Below that is a thin line of LEDs as a sort of marker light/fog lamp cue and at center is the super S. Just behind the headlamp is a thin line of LEDs probably indicative of signal and marker lights on a side view mirror. The overall style suggests one of thick power on a low profile as the windscreen shadow appears steeply cut. Expect more teasers and a trickle of information leading up to the full debut on September 27.